Julie Williams was born in the UK, spent her early twenties in France then migrated to Sydney, Australia in 1980. Here she built a career as a professional artist having attended the National Art School. In 2014 Julie moved to Asia living and practicing in Singapore for five years. She traveled widely through South East Asia, and spent a large amount of time painting and drawing in Jogjakarta on the Island of Java, Indonesia. completing a residency at her friend Jumaadi’s studio. Julie studied Asian Art at NAS and has always had an interest in cross-cultural influences. She also owns a home and studio in Hill End, NSW, where she continues to investigate the Chinese history in this historic gold rush town. Her conceptual, contemporary works with historical references have found a new direction through developing a print practice whilst living in Singapore at The Singapore Tyler Print Institute. Williams was based in the historic area of Tiong Bahru, Singapore from 2013-2018. She moved from her familiar regional-Australian landscape to this tropical, vibrant and richly-coloured urban environment where the old Peranakan history sits alongside the modern skyscrapers – a gentle reminder of past traditions in the face of Singapore’s relentless push towards modernity. Immersed in this new environment, her painting took a bold new direction. Combining exhaustive research of local culture and post-colonial South East Asia, her work explored new ideas. Her practice since living and exhibiting in Singapore has seen the introduction of screen printing, textiles and a vibrant colour palette. Her love of tracing elements over the top of her painting continues but using inks and dyes. 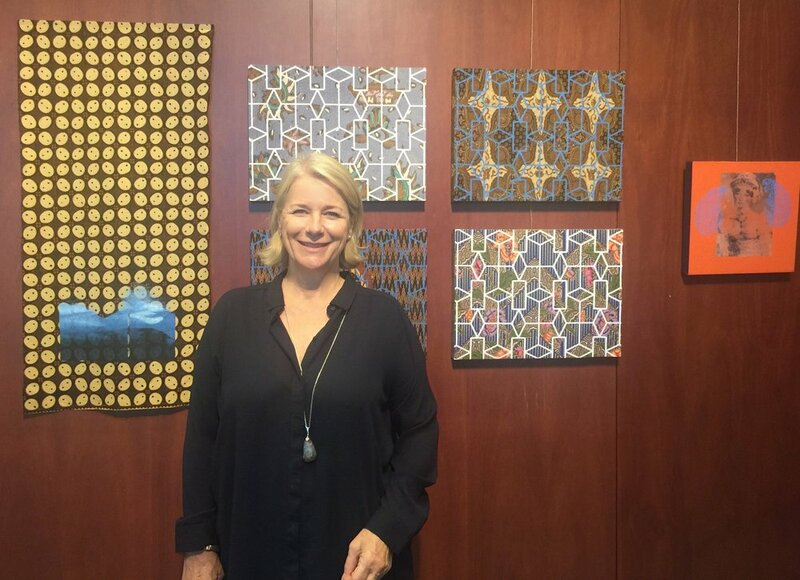 Williams residency in Jogjakarta , Indonesia combined with exhaustive research of South East Asia has led to new work which can be seen in the link below to her new survey exhibition Tracing Threads at Sheffer Gallery, Sydney, Australia. Julie Williams is a painter and print maker, exhibiting regularly in Australia, Singapore and Internationally. She has a BFA from National Art School, Sydney (2003) and a Post Graduate Educational Diploma in Fine Arts (2014) from University of Technology, Sydney. Solo Exhibitions include, Tracing Threads (2018), Sheffer Gallery, Sydney; White Tiger (2017),Travers Art Space, Singapore; The Nature of Existence (2013) WPCC Regional Gallery, Dubbo, NSW; The Great Divide (2011), BRAG Regional Gallery, Bathurst, NSW and Jean Bellette Gallery, Hill End, NSW (2012); Beyond the Great Divide (2012), Jayes Gallery, Molong, NSW.Selected Group Exhibitions The Misty Mountain Project 2017, Rumah Lebah, Jogjakarta, Indonesia; The Hill End Table, BRAG, Bathurst, NSW (2017); Nyonya Identification, Contact Sheet Gallery, Sydney (2016). In the Studio, BRAG, Hill End, NSW (2005-2017); Murrurundi Group Exhibition, Michael Reid Murrurundi Gallery (2015); Eclectica Collectica, Olsen/Irwin, Jayes Gallery, Molong, NSW (2013), Out of Hill End, Damien Minton Gallery, Sydney (2009). Residencies, Rumah Lebah,Indonesia (2017); Henry Lawson Estate Residency, Mudgee, NSW (2003); National Art School Landscape Painting Prize (2003). Finalist, Paddington Art Prize (2004/10/11). Her work is held in Bathurst Regional Gallery Collection, as well as numerous private collections. She is represented by Jayes Gallery, Molong, NSW and Michael Reid, Murrurundi, NSW.